I recently purchased the Herbal Chef Butter Maker on Amazon and finally got a chance to infuse some butter. 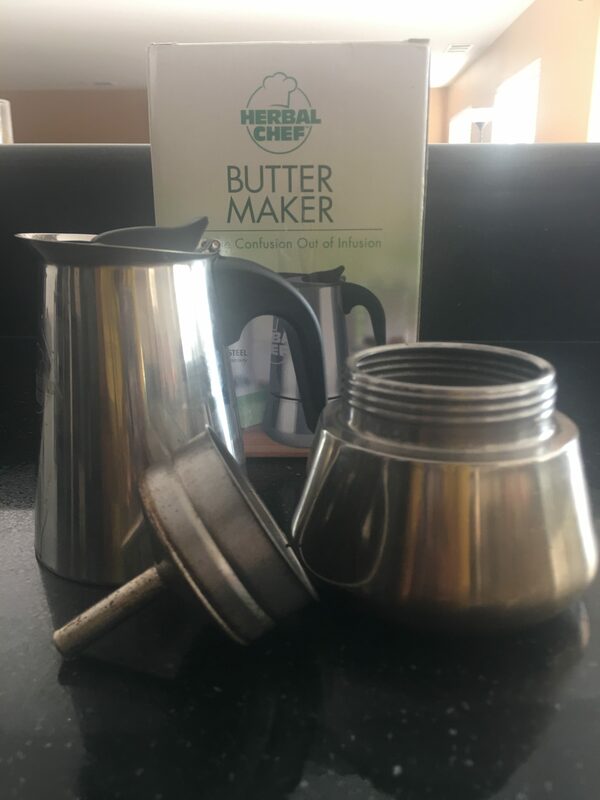 The herbal chef butter maker comes as a 3 piece kit. You have the upper chamber (looks like a kettle) a filter and a lower chamber. You will use this stainless steel butter maker to infuse your butter with whatever herb you choose. Keep in mind that certain herbs may need to be decarb’ed before you use the butter maker. The directions state that you take a stick of butter and cut it up into 1 inch pieces. Press the butter into the lower chamber. Add enough water to cover the butter. Make sure that the water does not go over the release valve. You will then put your filter into the lower chamber. Put whatever herbs that you are going to use to infuse your butter into the filter. Make sure that you don’t PACK the herbs in the filter, you still want the herbs to be able to move. Then screw the upper chamber on. We’re ready to get cooking now. Do not preheat your stove before using. Simply put the butter maker on to the eye of the stove and then turn it on. I have a gas stove so I made sure to keep a close eye on things. I turned the heat on medium and waited until I heard gurgling noises coming from the butter infuser. I then let it simmer for a few minutes. The total time I had it on the heat was about 10 minutes. Take some oven mittens and take the butter maker off the stove. I then placed it on a cooling rack to cool down a bit. If you want to do a second run through to make the butter even more infused you can do the steps all over again. I would recommend waiting on the liquid in the kettle portion to cool down a bit so that you can handle it. I then poured the liquid into a coffee mug until I was ready for it again. Unscrew the upper chamber from the lower chamber. Thoroughly clean out the lower chamber. Then you can put the liquid from the coffee mug back in the lower chamber and start the process again. Once you have your infused butter you will want to put it into a cheapie dollar store aluminum container that is easily bendable. I put the butter in the freezer for about 15 minutes. After about 15 minutes your butter should have floated to the top and became frozen. The water should still be liquid in the bottom. So I bend the aluminum container so that I can get the water out of the bottom. Then voila, you are left with herbal infused butter. If you want to serve it in its normal “stick” form. You will melt the butter again (do not use the aluminum container if melting in the microwave), then you can pour it into this butter mold. Have you ever infused butter? Have you done it the old fashioned way where you have to use a double boiler and it takes hours? Well, this is the new age way of infusing your butter. Let me know your butter infusion story in the comments.